Event registration & payments made easy. Designed for Luncheon & Dinner Events, Conferences, Seminars, Training programs, Membership payments, Trade Shows and more. Register Now To Start Setting Up Your Registration Form. Copy Events and save time. One click copies existing or past events. Choose between PayPal which offers a quick and easy way to accept credit card payments, or your own Bank credit card merchant account. National & international time zones to suit your event location. Choose multiple ticketing or individual registrations. Collect instant valuable market data on your event with the post event feedback. International date format & currency settings for your international events. Upsell Merchandise with quantity tracking. PLUS… Try My Booking Manager now and just for trying receive this Free BONUS, a page “Event Planning Secrets” Manual valued at $75. 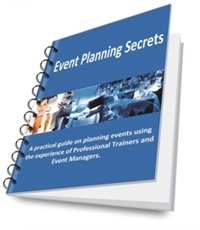 A practical guide for running events like conferences, workshops, road shows and seminars.